As an honorary Indian by marriage and daughter-in-law of someone who makes a mean chicken curry, I have long felt it is a skill I should have. I quickly realized that being taught by someone who has made it thousands of times over the years is not an easy feat. The instructions tend to include phrases like, “a little bit of this” and “some of that”. 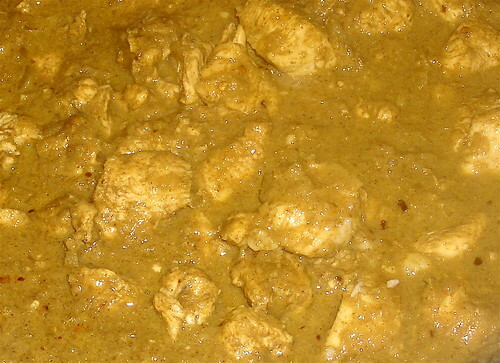 Nevertheless, for a few years now I have attempted to make chicken curry again and again by trying to reproduce what I had observed and simply experimenting with small changes. It never turned out bad, per se, just not quite good. I’d rate most of my attempts somewhere in the range of “edible”. Chop the chicken into bite-sized pieces. Dice the onion, mince or press the garlic, mince the garlic and dice the chile fine. Remember the key to Indian cooking: First, toast your spices in oil. In a large pot over high heat, pour in 3 tablespoons of ghee or olive oil. Let it heat until tiny wisps of smoke can be seen. Now add the spice mix. Stir this mixture until the spices begin to turn brown and toast. Approximately 1 minute. DO NOT TAKE YOUR EYES OFF THE POT. IT WILL BURN! Once the mixture has browned, add the onions, the ginger and the pepper. Liberally salt the mixture (approximately 1 tsp). You want to hold back on the garlic. (Once garlic burns it becomes bitter in taste.) After about 2 minutes, you should see the onion begin to change color. Now add the garlic. Cook for another minute over high heat. This step should result in a dark, spicy paste of vegetables and spices. Salt the chicken and then add it to the pot. You may need more oil or ghee at this point; if the pan is too dry, add the remaining tablespoon. Begin to brown the chicken. Approximately 4 min. Once the chicken starts to brown, it’s time for the wine. This step is a pretty well-known technique called deglazing. Sure, the wine adds flavor — but you’ll also notice all the brown bits on the bottom of the pot. You are also using the wine to scrape those up. Those little bits are full of flavor, and you want them incorporated into the final product. So as soon as you add the wine, use your spoon or silicon spatula to start scraping them up into the liquid. Once the wine begins to cook off and be absorbed by the meat, turn down the temperature to medium. You’ll notice that the browned bits are emerging again. This time, you’re going to add coconut milk to deglaze. Work up all the nice patches of spice and bits. Once you’ve done this, turn the temperature down to low, cover with a lid, and let cook for about 15 min. Turn off the heat. Stir in the yogurt. Serve over rice. As always, I was missing a few ingredients and had to improvise a bit. I replaced the white wine with some concord grape wine of Marc’s that was packed by mistake and ended up moving with us. I used less than the recipe called for, for fear that the grape flavor would be entirely incompatible with curry. Then I added a bit of vinegar, which may have been silly, but it worked just fine. I also replaced the various kinds of chilis and spicy powders with one healthy dose of cayenne powder. I never noticed the little brown bits that required deglazing, but it may have been the pan I was using. Nevertheless, the wine and coconut added to the flavor so I’ll keep them in next time. I also managed to forget the amount of coconut milk to add during my walk from the laptop to the kitchen and ended up doubling it. No problem, the result was just closer to a coconut chicken curry rather than chicken curry with a bit of a coconut flavor. 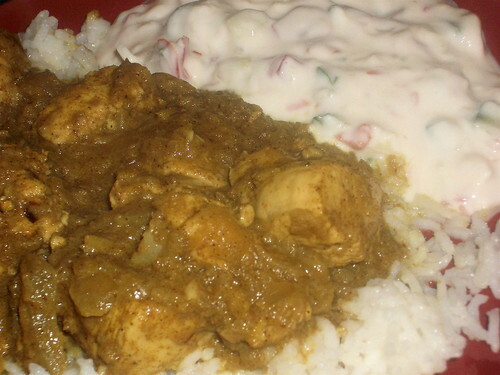 I served it up with some delicious raita and it was fantastic! It wasn’t exactly my mother-in-law’s curry, but it stood on its own as a tasty dish definitely worth making again. If any of you have favorite curry recipes, I’d love to read about them! You’re inspiring! Fortunately, my Indian man hates Indian food, oddly, so I’ll only be cooking it for myself.